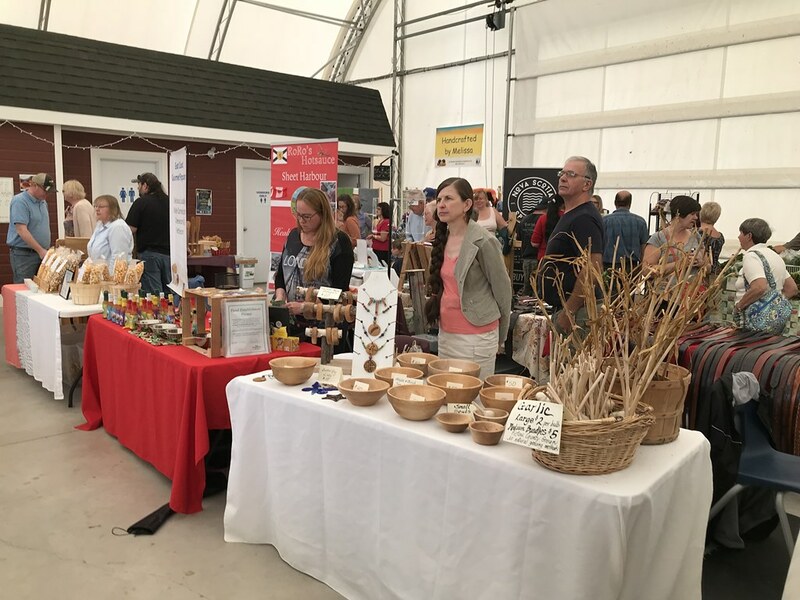 This past weekend we had a fab time at the weekly New Glasgow Farmer’s Market. 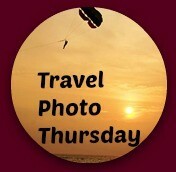 Welcome to week 345 of Travel Photo Thursday. My apologies for last weeks absence, but Indy and I continue to live the vagabond lifestyle. Last week we were in a lovely New Glasgow apartment with no Internet and my trusty old laptop refused to connect to the public library Wifi. 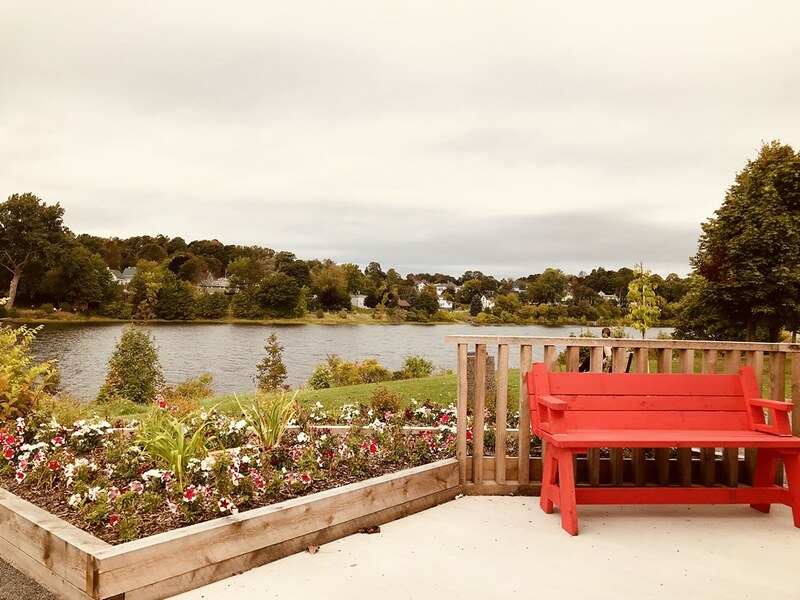 We are back in Pictou this week with both a Wifi connection and a brand new computer. Wherever I am in the world markets are always at the top of my list. 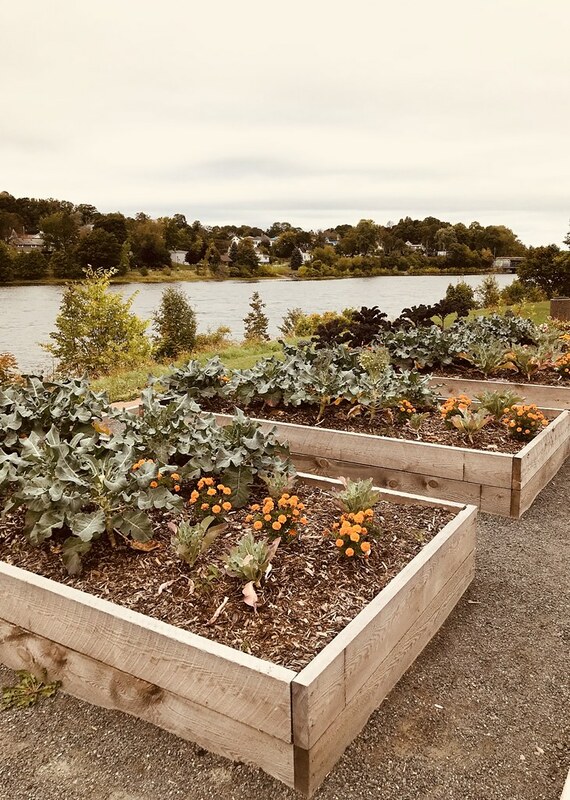 Come along as we enjoy this Nova Scotia gem; the New Glasgow Farmer’s Market. If you’re driving you are in luck. The parking lot is located steps away from the market buildings. It’s free, and there’s no shortage of spaces. The building on the right is the permanent building and the white domed building is a tent and is closed once the weather becomes too nippy. None of the vendors I spoke to had an exact date, but it probably depends on the temperatures. We’re having an exceptionally mild fall (think swimming in the ocean end of September), so if this keeps up both buildings could be open for a while yet. 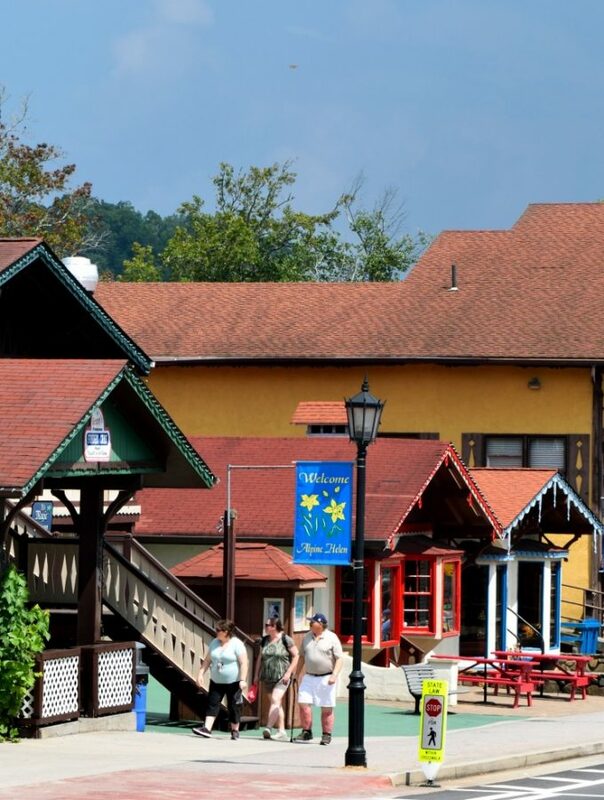 The market is open every Saturday from 9 am – 1 pm. If I was coming here in the winter months I would double check on their website just to be sure. You’ll also find a list of vendors. 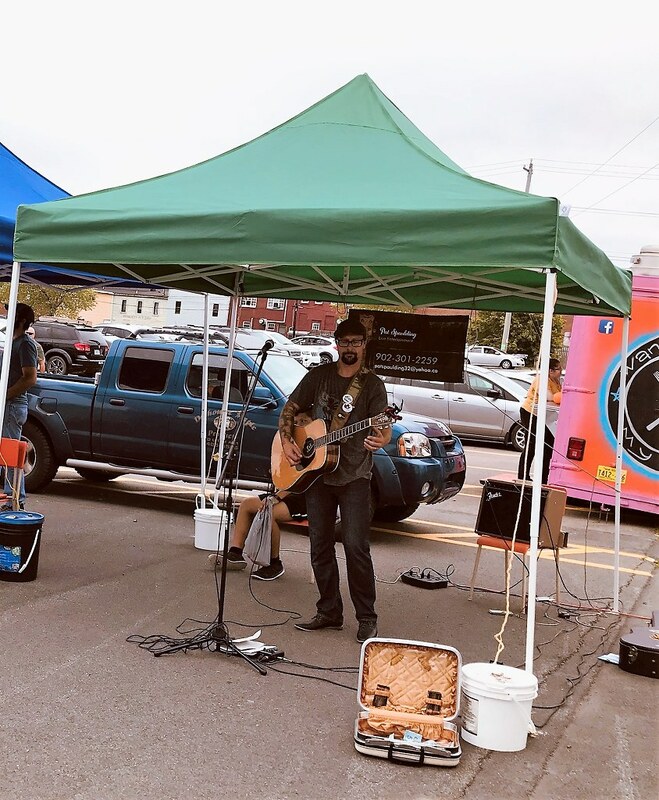 Music is popular at any of the farmer’s markets I have frequented in Nova Scotia, and the New Glasgow Farmer’s Market is no exception. The crowd (me too) seemed to enjoy this singer/guitar player’s upbeat and catchy tunes. The local fruit and vegetables on offer were the freshest I have seen in a long time and the prices made my wallet smile. Everything was advertised as GMO and pesticide free. You can’t get any better than that in my opinion. 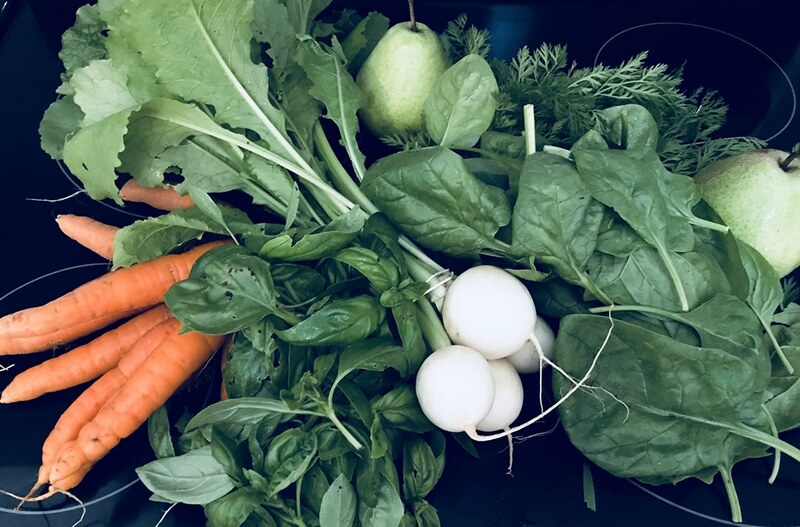 I walked away with pears, spinach, baby turnips, carrots, and basil. I have never smelt such fragrant basil. When I opened the bag at home I literally buried my head in the leaves. Cannot get enough of that amazing aroma. Next year I will have my own basil plants to harvest. This was my first encounter with the baby turnips. Oh, my! The seller recommended cutting them up and putting them in a salad raw. Very crunchy with a pungent peppery flavour. 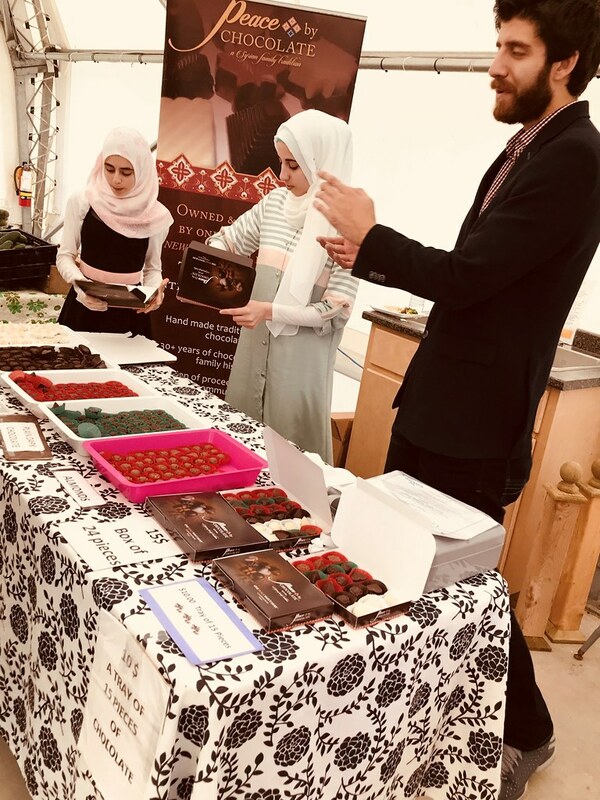 This chocolatier is from a neighbouring town, Antigonish and he’s become quite famous here in Nova Scotia. He and his family came to Canada about two years ago under the Canadian Syrian Refugee Program. He took advantage of his chocolate-making skills and now manufactures his brand in Antigonish and sells it there and in surrounding towns. I read a few weeks ago where the government has just appointed him (sorry, don’t know his name) to a provincial economic development board. They were only selling by the box at the New Glasgow Farmer’s Market, so I didn’t get to try any. Maybe next time they’ll have onesies on offer. 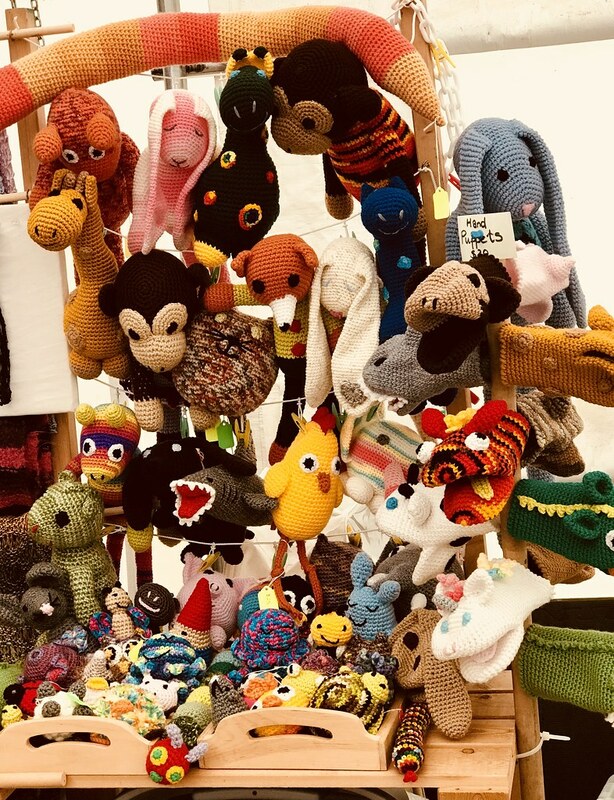 In addition to the many food choices available (which I have barely touched on here), there are oodles of local, talented artisans/craftspeople offering their creations at fair prices. What kid (or kid at heart) wouldn’t love to cuddle with one of these colourful cuties. Aren’t the hand puppets adorable? The lady in the blue shirt at the far end is a gourmet popcorn maker. She had samples on offer —DELISH!. The middle vendor was selling her own hot sauce. I tried the spicy (you know me and spicy) and loved it. I probably would have purchased one, but I have a new bottle in my fridge bought at the grocery store the other day. It’s on my list for another visit. As you can see, the third seller works with wood. Her bowls are made from birch or maple, and I thought reasonably priced considering the amount of work that goes into creating each piece (started around $50.00 Cdn). This is the kind of thing I love to purchase when I’m traveling. 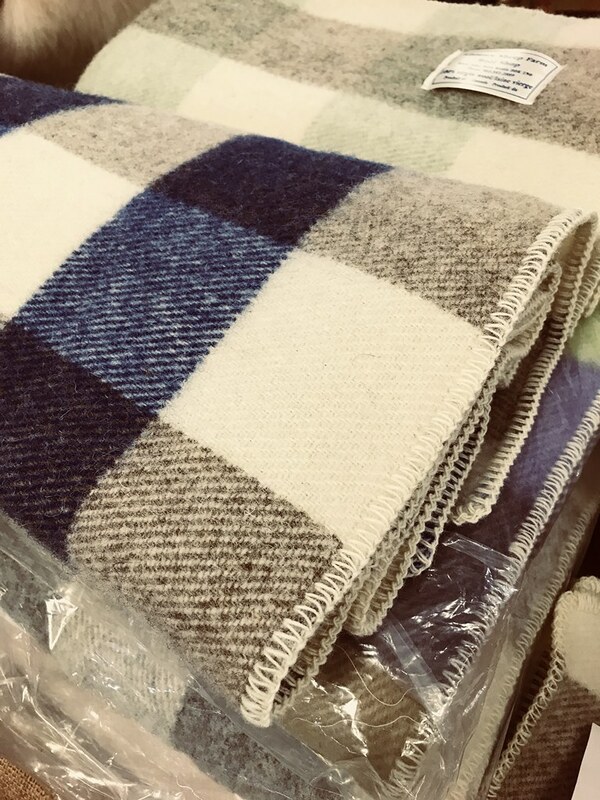 Easy to pack, good price, and fits into any home or apartment. 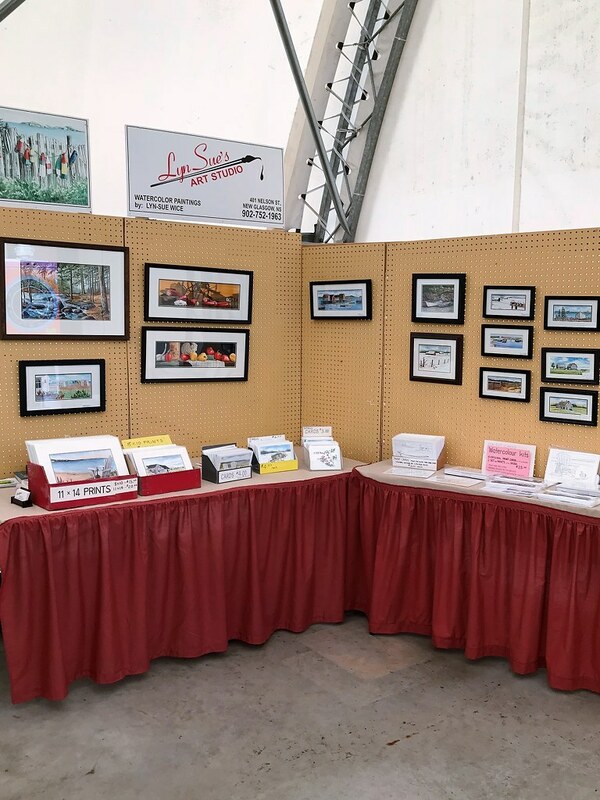 This local photographer/painter had a beautiful selection of framed photos and paintings for sale. 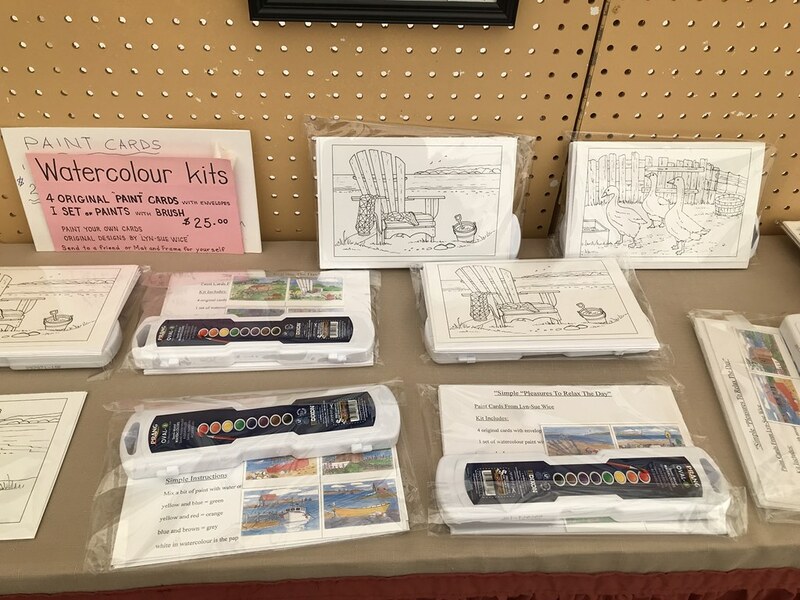 The watercolour kits make a nice souvenir. My other purchases included this wooden soap dish (made from birch), moisturizer made from hemp, and this bottle of delicious pure honey. Products containing hemp seem to be all the rage right now. There was also a vendor selling hemp oil and seed which he his partner (probably wife) manufacture. Apparently, hemp oil can be used as an olive oil substitute and its supposed to be a healthy choice. I think I’ll do some research and maybe I will invest in a bottle next time. 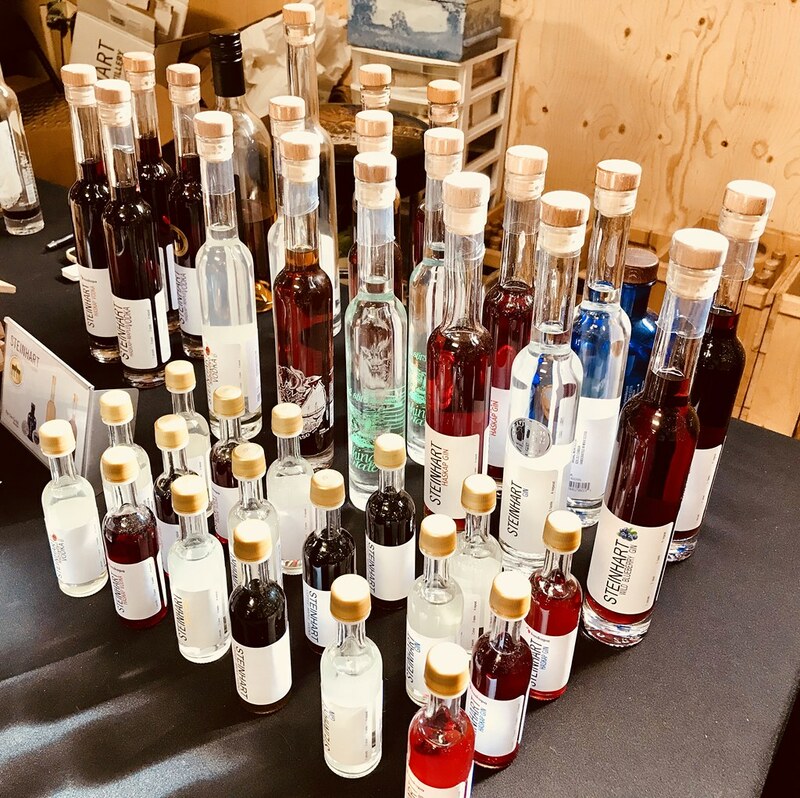 Wineries and distilleries are one of the big cottage industries here in the province, believe it or not. Quite a number of them sell (and offer samples) at the New Glasgow Farmer’s Market. Sampling the different spirits and wine is always fun. The vendors are happy to share a sample or two and talk about their operations. Finally, my favourite booth at the New Glasgow Farmer’s Market was the Lismore Sheep Farm booth. 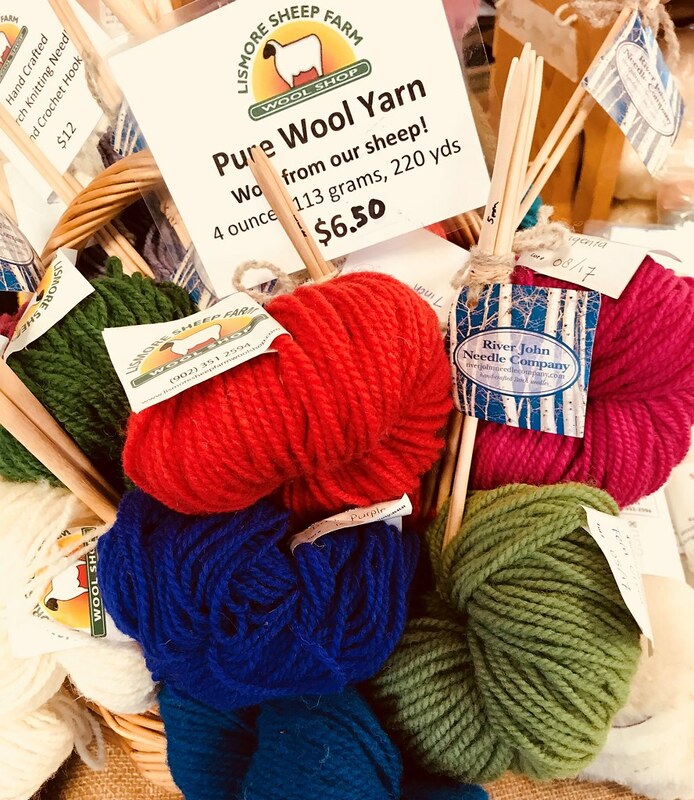 Although I’m not a knitter, I do love wool and wool creations. 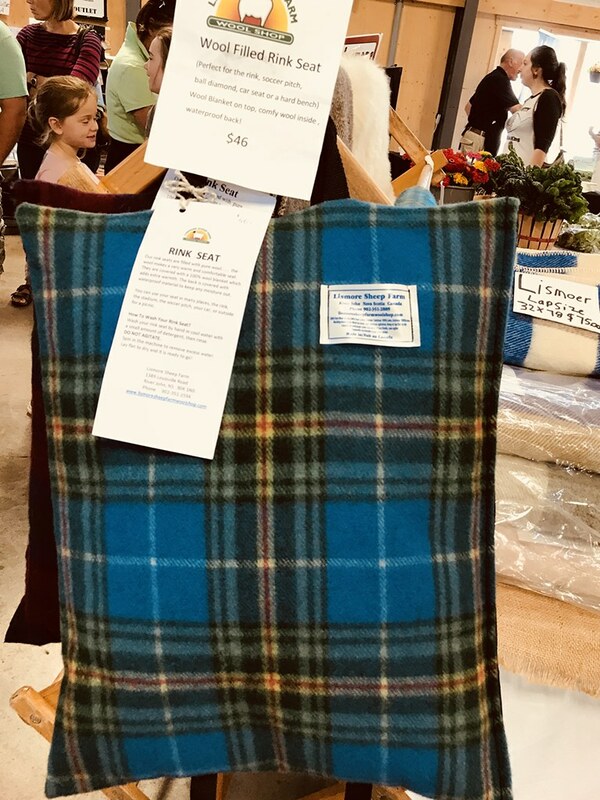 One of these beautiful woolen lap quilts has my name on it  If you’re spending any time at the rink, and many Canadians do, this Nova Scotia tartan rink seat is perfect! What better way to end a morning at the market than with a coffee and a beautiful (unexpected) view. Behind the permanent market building is this gorgeous seating area with a river view. 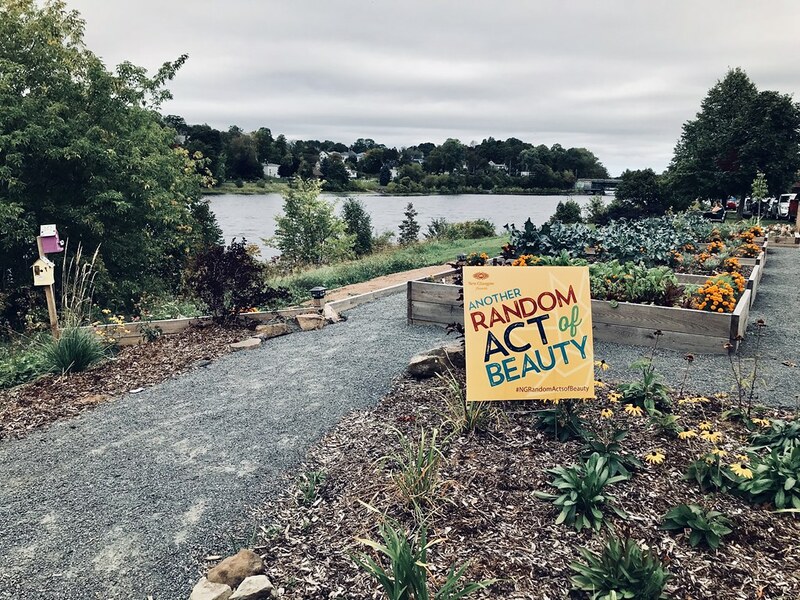 The planters filled with product and flowers are part of the “Another Random Act of Beauty” project, where locals do things (like plant these planters) to beautify the town. I believe the project is part of the Canada 150 celebrations. 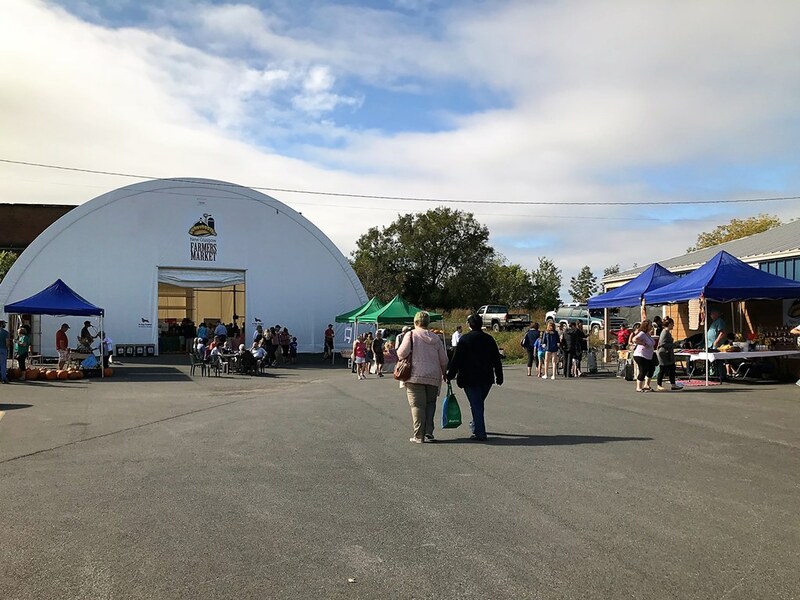 The New Glasgow Farmer’s Market is located at 261 Glasgow St. and is open year-round from 9 am to 1 pm. In addition to their website, you can also find them on Facebook. Have you been to a good market lately? Tell us in the comments. The GMO and Pesticide free vegetables would have me filling my bags too. The white turnips look like white radishes! I love growing basil. It grows very quickly here and we have to remove the flowers daily, to keep the plant thriving. I harvest masses of it and make basil pesto with macadamia nuts instead of pine nuts. Then I freeze it in smaller containers and use it for pastas and cover cubes of danish feta with it to use in salads. The mild weather must be in honour of your arrival home Nancie! You are giving me some serious wanderlust to visit Nova Scotia! 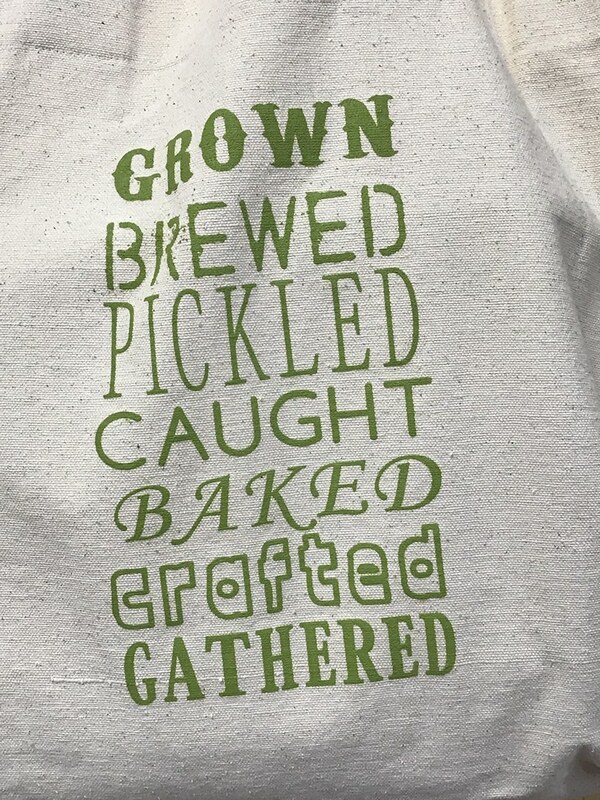 Love the bag/shirt with the Grown/Brewed/Gathered saying on it! Oh last week — one of the few times this summer that I have actually remembered something at the time it was to be remembered, I did try to link up and you weren’t there. I just chuckled knowing that you and I are both in our own little corners of the Twilight Zone! 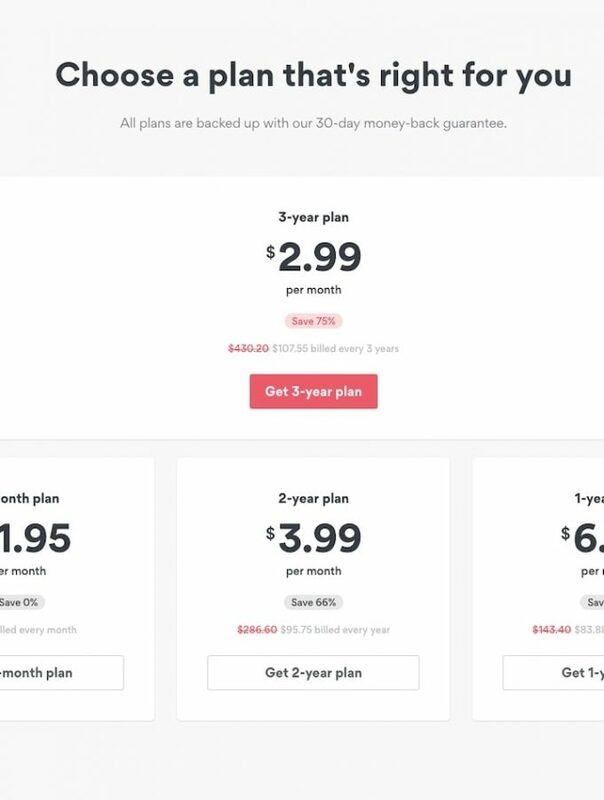 Glad you are back – great looking market. What a fun place to enjoy and take photos! I especially love the photo of that red bench! Markets are a favorite of mine. Well, you maybe know that! I love the story about the Syrian refugees. I am going to share with a friend who works with many of them on Athens. She would love to see how people like this are building a new life. I love a good farmer’s market! I had heard about the story of the chocolatier. It’s such a great story and I’m so happy to hear of him and his family building a new life! I hope there are many other success stories like that one.